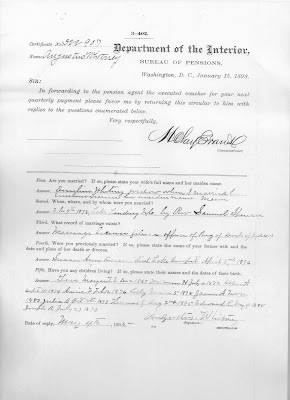 So here is another section of Augustus Whitney's Civil War Pension file. That he is now unable to earn a support by manual labor by reason of injury of right arm. That said disabilities are not due to his vicious habits and are to the best of his knowledge and belief permanent. That he has applied for pension and that he is a pensioner under Certificate No. 322,907. 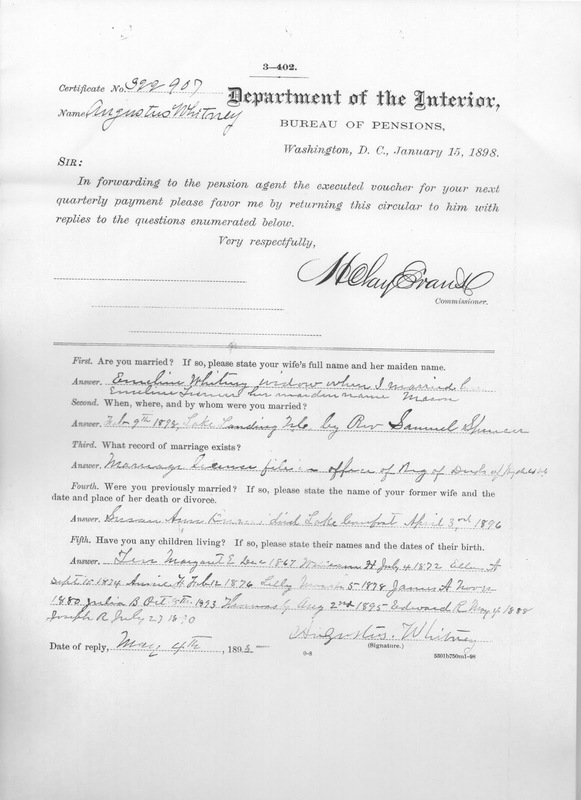 That he makes the declaration for the purpose of being placed on the pension-roll of the United States under the provisions of the act of June 27, 1890. He hereby appoints with full power of substitution and revocation, A. B. Webb of Washington, D.C his true and lawful attorney to prosecute his claim, the fee to be Ten Dollars as prescribed by law. 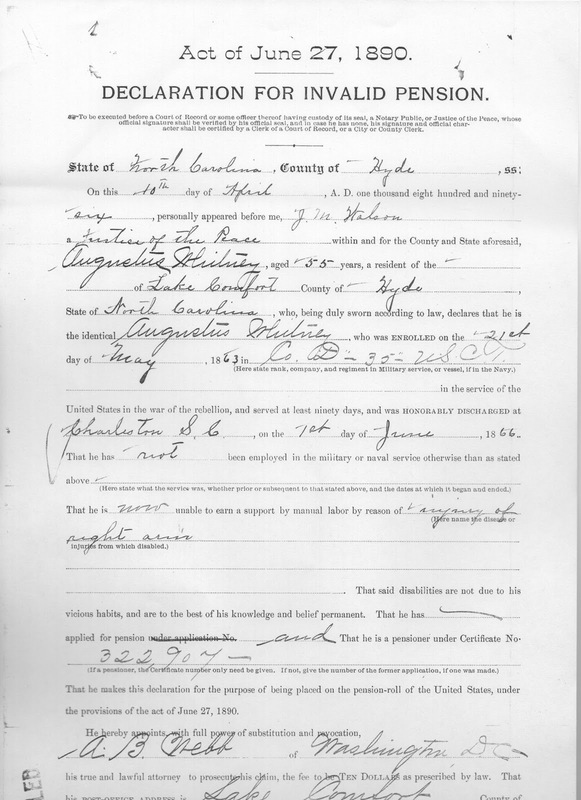 That his post-office address is Lake Comfort, County of_____________, State of N.C.
Also personally appeared Greely Brim, residing at Swan Quarter, and J W Hayes, residing at Lake Comfort, persons whom I certify to be respectable and entitled to credit, and who, being by me duly sworn, say that they were present and saw Augustus Whitney, the claimant, sign his name (or make his mark) to the foregoing declaration; that they have every reason to believe from the appearance of said claimant and their acquaintance with him for 10 years and 30 years respectively, that he is the identical person he represents himself to be and that they have no interest in the prosecution of this claim. erased, and the words_________________________________added; and that I have no interest, direct or indirect, in the prosecution of this claim. 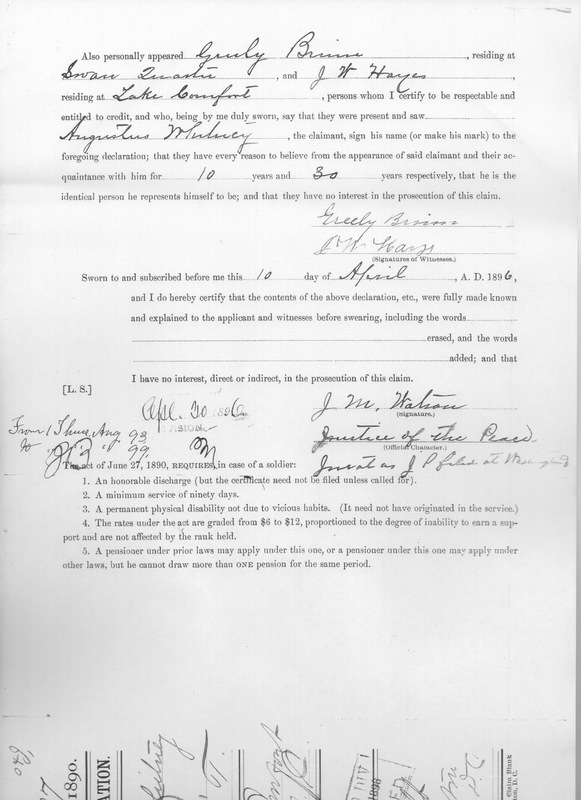 The act of June 27, 1890, requires, in case of a soldier: 1. 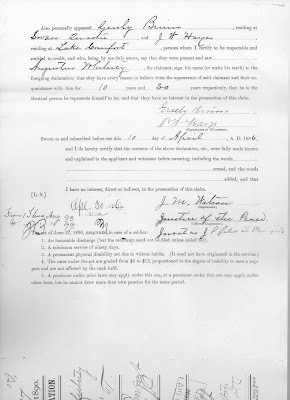 An honorable discharge(but the certificate need not be filed unless called for). 2. A minimum service of ninety days. 3. A permanent physical disability not due to vicious habits. (It need not have originated in the service.) 4. The rates under the act are graded from $6 to $12, proportioned to the degree of inability to earn a support and are not affected by the rank held. 5. A pensioner under prior laws may apply under this one, or a pensioner under this one may apply under other laws, but he cannot draw more than one pension for the same period. Washington, D. C. January 15, 1898. In forwarding to the pension agent the executed voucher for your next quarterly payment please favor me by returning this circular to him with replies to the questions enumerated below. First, Are you Married? If so please state your wife's full name and her maiden name. Answer. Emeline Whitney widow when I married her, Emeline Turner her maiden name Mason. Second. When, where, and by whom were you married? Third. 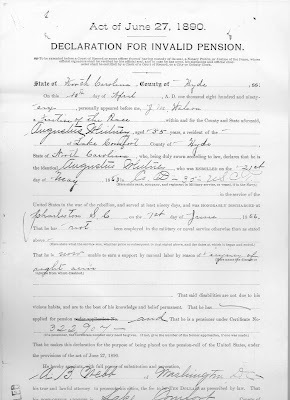 What record of marriage exists? Fourth. Were you previously married? If so, please state the name of your former wife and the date and place of her death or divorce. Fifth. Have you any children living? If so, please state their names and dates of their birth. Answer. Ten. Margaret E Dec. 1867, William H July 4, 1872 Ellen A Sept. 10 1874 Annie H Feb 12, 1876 Lilly March 5, 1878 James A Nov 22 1880 Julia B Oct 8th 1893 Thomas G Aug 2nd 1895 Edward R May 4 1888 Joseph R July 27 1890. Points of interest I have put in bold print. What a treasure trove of information. Today was a good day.